Demand for disinfectant and antimicrobial chemicals in the US is forecast to rise 6.1 percent annually to $1.6 billion in 2017. Organosulfur compounds will see significant growth as antimicrobial agents in products such as water-based architectural paint, floor coverings, home textiles, and other construction materials. 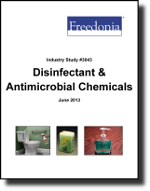 This study analyzes the $1.2 billion US disinfectant and antimicrobial chemical industry. It presents historical demand data for 2002, 2007 and 2012, and forecasts for 2017 and 2022 by market (e.g., industrial, institutional and commercial, consumer), function (disinfectants and sanitizers, antimicrobial additives), and product (e.g., phenolics, iodophors, nitrogen compounds, organometallics, organosulfurs, aldehydes). The study also considers market environment factors, details industry structure, evaluates company market share and profiles 20 industry players including Dow Chemical, Lonza, BASF, Ecolab, and LANXESS.